I have for some time believed that one of the most under-valued botanical assets at Emu Valley is our display of vireya rhododendrons. We are one of a handful of gardens around the world that can grow them outdoors and also have them flowering throughout the year. Of the visitors to EVRG, I would estimate that 90 % have never heard of the vireyas. I would hope that in the future we can access funding to provide signage to better highlight this delightful section of the garden. Little is also known of our two endemic vireyas - R. lochiae and R. viriosum, which grow in North Queensland on inland peaks between Innisfail and Cooktown. 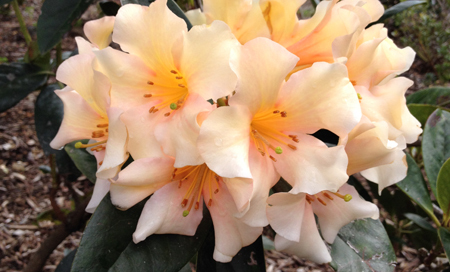 Our ability to grow the Vireyas outdoors (rather than in glass houses) in a frost free section of the garden, means that we now have the largest collection of species rhododendron growing outdoors in the world.